The ThinkJet represented the commercial birth of inkjet printing technology. The original ThinkJet was impressive - high print quality (192x96dpi), fast (150cps) and cheap. 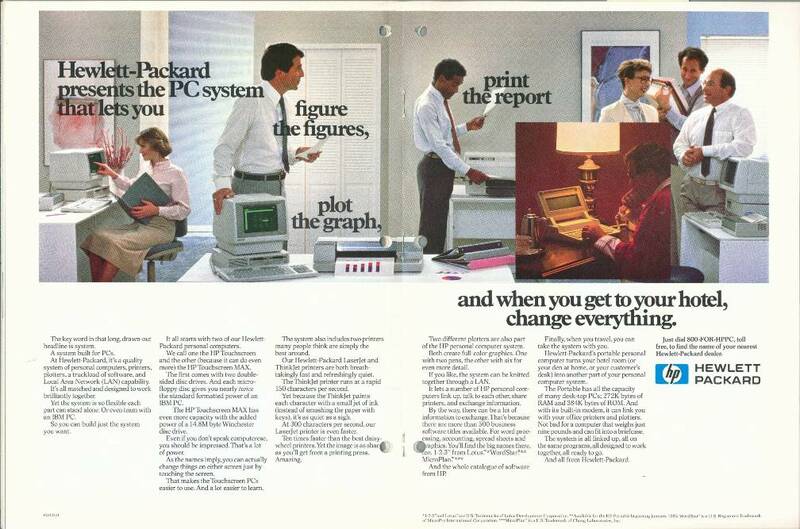 It was targeted at the mainstream Epson impact dot matrix printers of the day. 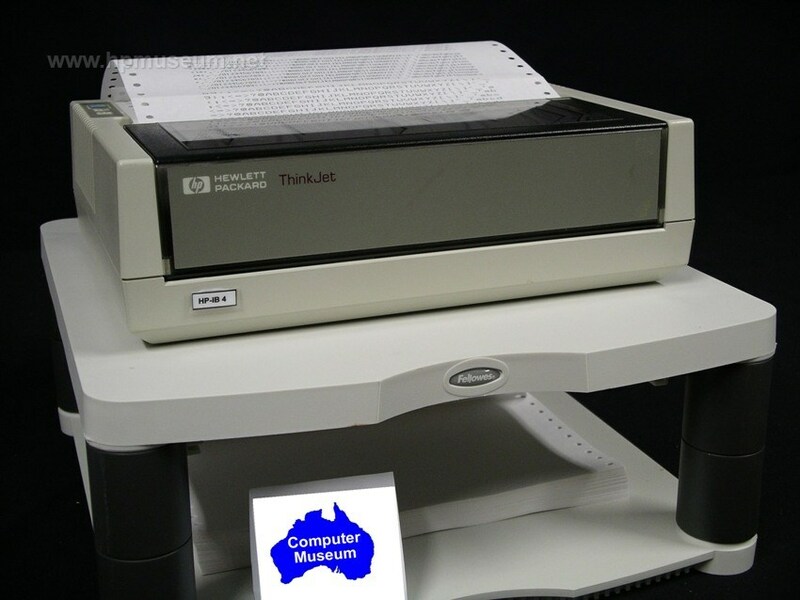 In addition to Centronics or RS-232C interfaces, the ThinkJet was also available in HP-IL and HP-IB interfaces (the most connectable HP printer ever!). However, the ThinkJet had some drawbacks which limited its acceptance and slowed the uptake of inkjet technology: it required special paper which was inconvenient for users, printheads were expensive, hard to get and unreliable (HP included instructions with the printheads which explained how to reprime the units using a bent paperclip). The printer's key benefit as far as customers were concerned was its quiet operation. Office workers were used to impact printer's jackhammering; the ThinkJet was whisper quiet. It was a big seller in libraries worldwide. 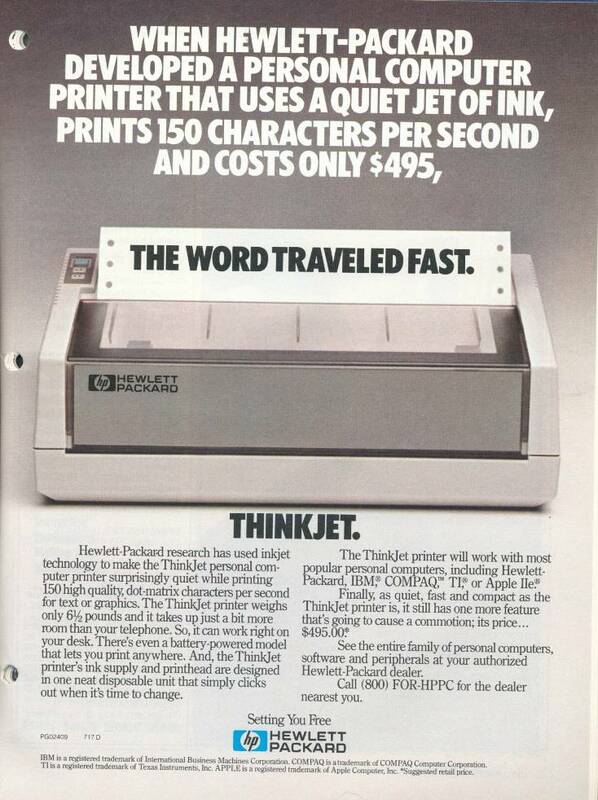 The ThinkJet was also the smallest printer produced by HP until 1992. The ThinkJet was the first HP printer to carry the "Jet" name, subsequently adopted by tens of millions of printers, including "LasetJets". Click here to view CuriousMarc's video of a ThinkJet printer compared to a daisy wheel printer. The HP-IB, Centronics and serial versions of the ThinkJet are very reliable. All of the units held at the museum power up and print. The most common problem with these printers is blocked or non-firing print nozzles. To fix blocked print nozzles on the printhead, dip a cotton bud in isopropyl alchohol and rub it against the printhead substrate. This will dissolve any dried ink that may be blocking print nozzles. If this doesn't work, it may be necessary to replace the printhead. The cause of non-firing printheads is usually a poor contact between the printhead substrate and its connector on the print head housing in the printer. To fix this problem, dip a cotton bud into isopropyl alchohol and rub it against the electrical connector on the print head housing. On printers that haven't been used for awhile, this will usually produce a very black cotton bud caused by dissolved ink. It will probably be necessary to repeat this procedure several times until all the dried ink is cleared. Unfortunately, even these processes won't clear all printhead problems. It will usually fix 30% to 50% of the problems. The HP-IL version of the ThinkJet comes with a rechargeable battery. To run from an AC power outlet, this unit requires a special AC adaptor. It will not work with a normal electrical plug. The original batteries no longer hold a charge. The AC adaptor will not drive the printer if the battery is dead. The battery pack must be rebuilt in order to get any power to the printer. These battery packs are fairly easy to rebuild with just a little bit of soldering. The pack is made up of six 1.2V, NiCad, SC-size batteries (1500 MAH will do nicely). The Panasonic part number for these batteries is P-150SCS/A02. We have found the HP-IL ThinkJets to not be reliable. Only one of the six units held at the museum will print. One of the units failed the non-printing self test. Four of the units work fine with respect to carriage movement and paper advance, but won't print any dots.